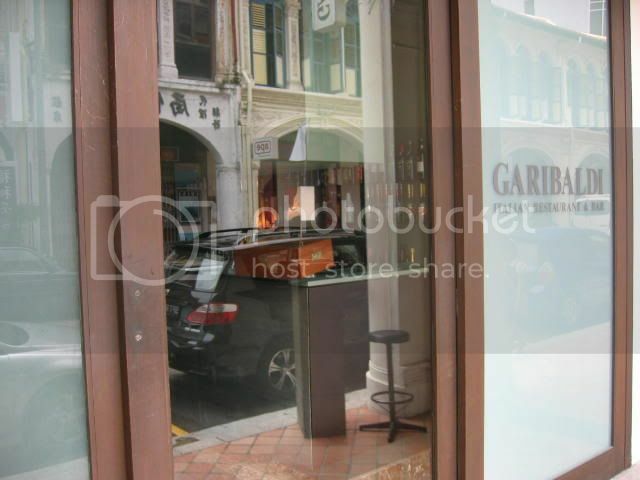 Garibaldi has always been at the forefront of fine Italian cuisine in Singapore, withstanding the recent arrivals of Il Lido, Oso and others. Like the eponymous Italian revolutionary, Garibaldi looms large in our hearts, romancing us with fond memories long after the actual experience is past. I've always felt that Garibaldi is exceedingly well-camouflaged for a fine dining establishment. Situated along Purvis Street, it's very easy to walk past without realising it. 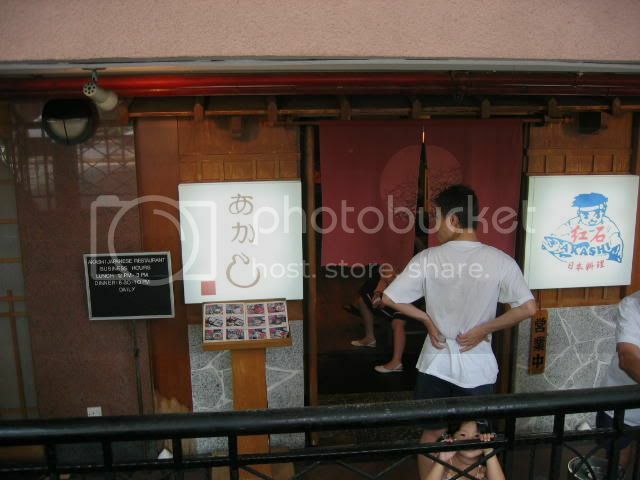 The door slides open from the inside, leaving you to wonder if they actually expect walk-in diners. 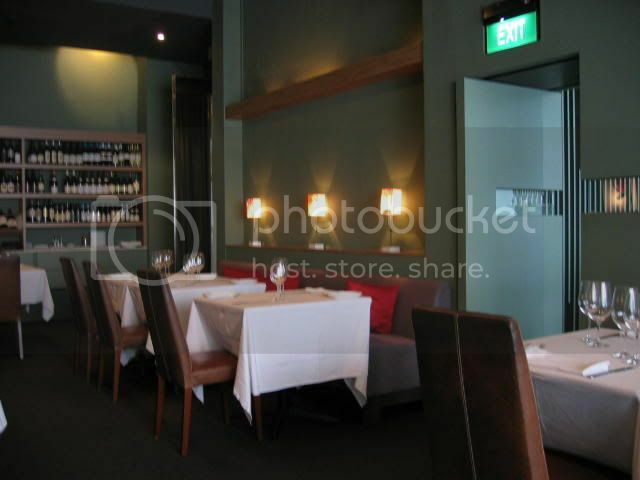 The interior of Garibaldi is very chic and sleek, with many emphasised lines and corners. The seats are plush leather and quite comfortable indeed. One of the most underrated things about Italian restaurants, I find, is bread. Garibaldi does an amazing sun-dried tomato bread which is just crusty on the outside, but fluffy on the inside. 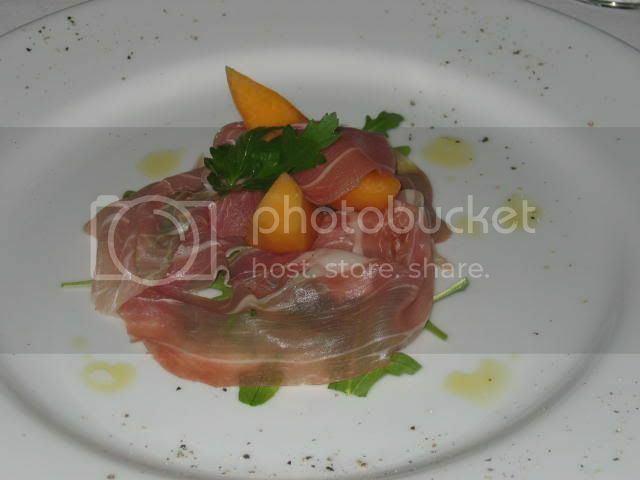 We were fortunate enough to have Chef Roberto prepare us a degustation lunch menu which started with a truly traditional serving of prosciutto ham and melon, on a bed of arugula leaves. Simple, yet a dish in which the freshness of the produce Garibaldi uses really shone through. The ham was thin, translucent and wondrously fresh, as were the arugula leaves. Not to be outdone, the melons shone through with their sweet juiciness. 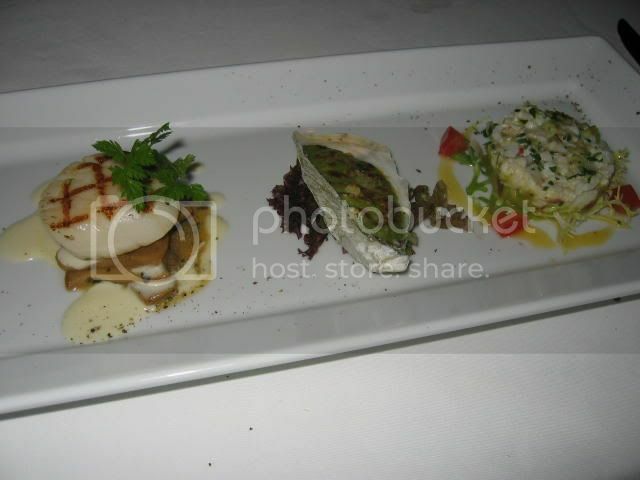 Next came the seafood platter, of sorts, comprising a grilled scallop atop porcini mushrooms, an oyster gratine, and a crabmeat salad. All were excellent, though I still dislike oysters. The scallop was fat and succulent, nicely paired with slices of intense porcinis. The oyster was gratineed with some cheese and possibly parsley, but it still couldn't disguise the strong taste of the oyster, not something I'm a fan of. The crabmeat salad was refreshing and heady, really enjoyable stuff. 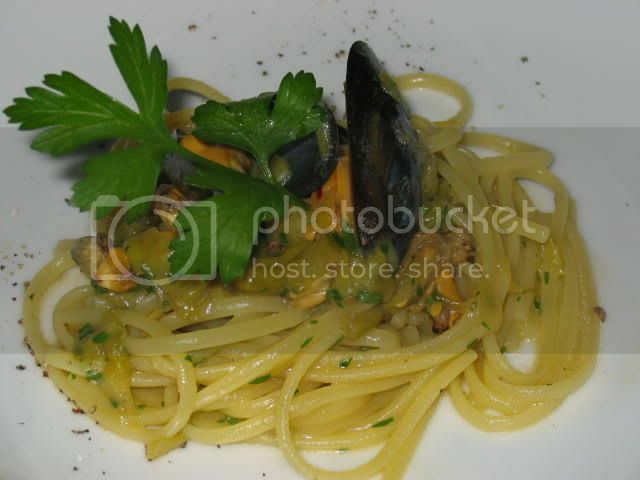 I wasn't that blown away by the spaghetti vongole, though that was due to my own tastes rather than any shortcoming of the dish itself. I felt the sweetness of the onions rather overpowered the taste of the wine. The clams were quite lovely though. 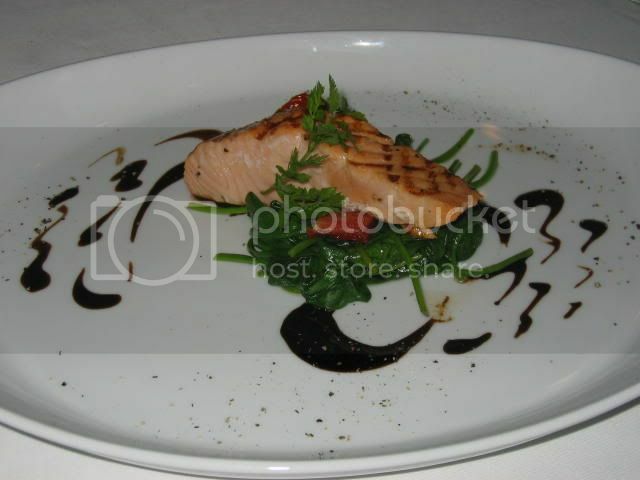 The main course was a grilled filet of salmon, just seared on the outside, and with a hint of rawness on the inside so as not to destroy the delicate texture and flavour of the fish. This was served on a bed of spinach leaves, and dressed with squiggles of balsamic vinegar. The salmon was excellent, smooth and naturally oily, flaky without being powdery. 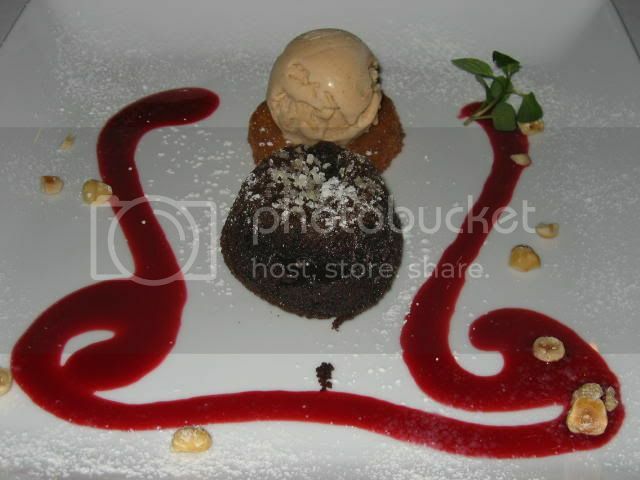 Dessert took the form of a warm chocolate cake served with hazelnut ice cream and raspberry coulis. It's hard to go wrong with something like this, and despite a slight imperfection in the cake's exterior, the chocolate was warm, oozy and lusciously rich. The hazelnut ice cream, while a bit unusual, actually complemented the chocolate quite nicely, mellowing out the flavours. That raspberry coulis was extremely tart, meant to cut through the sweetness of the ice cream and cake, but it was a bit too sharp for me. All in all an enjoyable lunch not to be found on the regular menu (which is three courses for $26), and a first-hand experience of Chef Roberto Galetti's deft touch in preparing traditional Italian cuisine with updated refinements. Service, while a little inchoate, is generally acceptable and does not detract from what is one of the best Italian restaurants in Singapore, worthy of its heroic namesake. Overall: Italian dining at its elegant best. 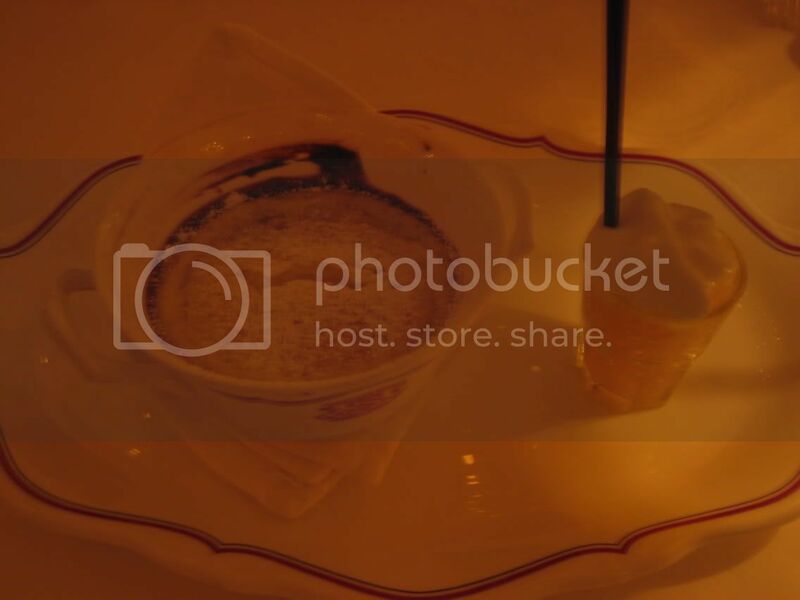 You know in movies, there's always that stereotypical French restaurant, that the guy takes the girl to in order to impress her with his worldly ways? You know the one - the lighting is mellow and muted, the only sounds you hear are to soft rustle of napkins and the melodious clink of cutlery, waiters in stiffly pressed suits wheel cheese trolleys around, and you're requested to adhere to the dress code. 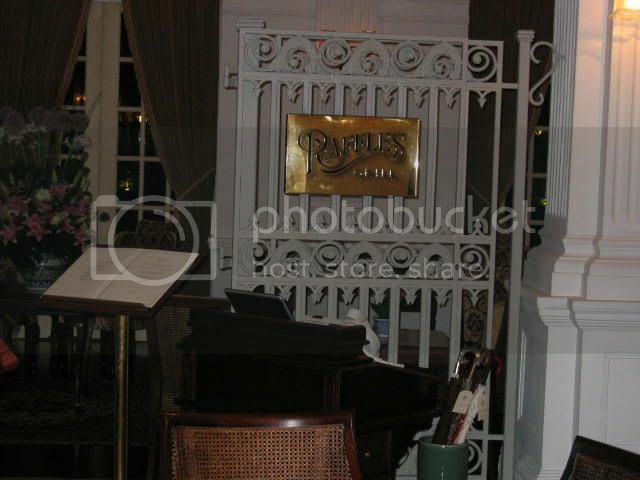 The Raffles Grill is just like that. They even have their own piano player, tinkling his soul out on the ivory keys while you enjoy your dinner. 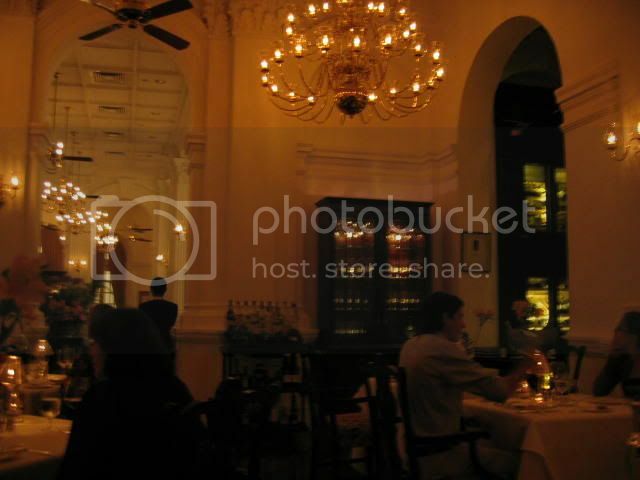 The Raffles Hotel is truly an impressive venue for dinner. As you walk into the main foyer, the splendour and history evident in every nook and cranny of this grand old dame cannot fail to arouse your admiration. 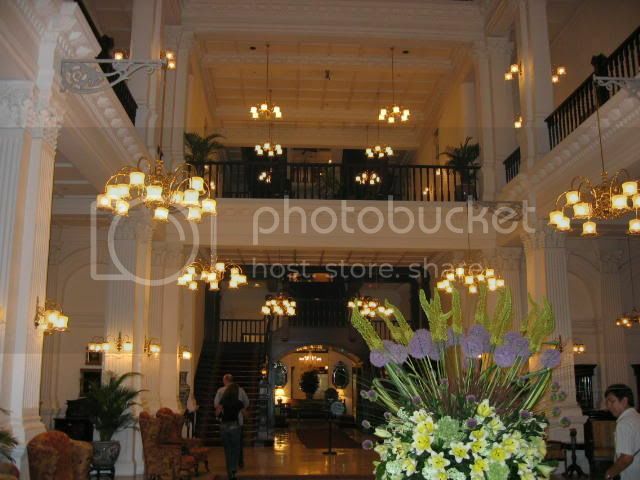 Even the massive floral arrangement exudes a welcoming perfume as you walk past. See what I mean about the lighting? I was forced to turn off my flash, so the quality of the following photos may not be fantastic. There is a dress code at the Grill, as well - no slippers, short-sleeved shirts or jeans, and socks are compulsory. The new chef is French and knows his craft well, so there were many in-between courses and palate-teasers; which in addition to whetting your appetite for the main event, helped you feel as if you were getting your money's worth. 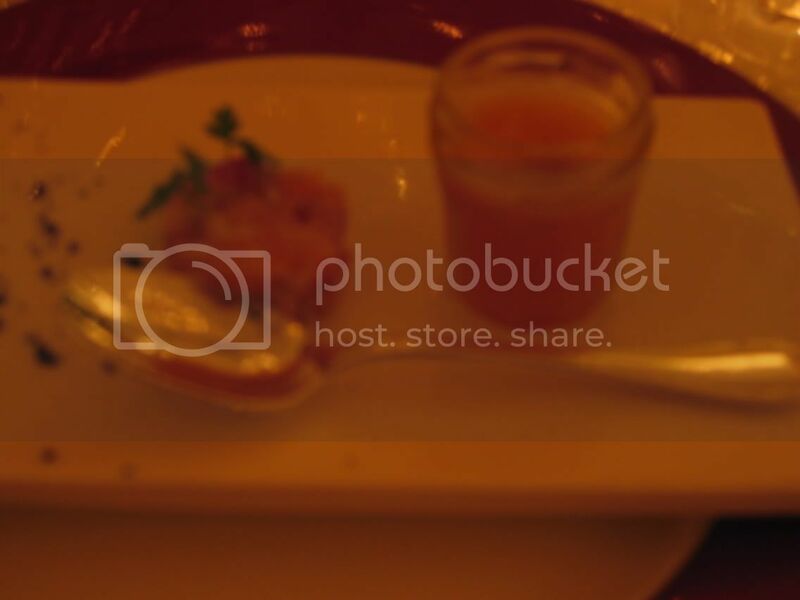 In this case, the amuse-bouche was a salmon tartare served with a sweet melon gazpacho. Very light and understated, the smokiness of the salmon certainly did its job well, my two dining companions began craving a fish course. 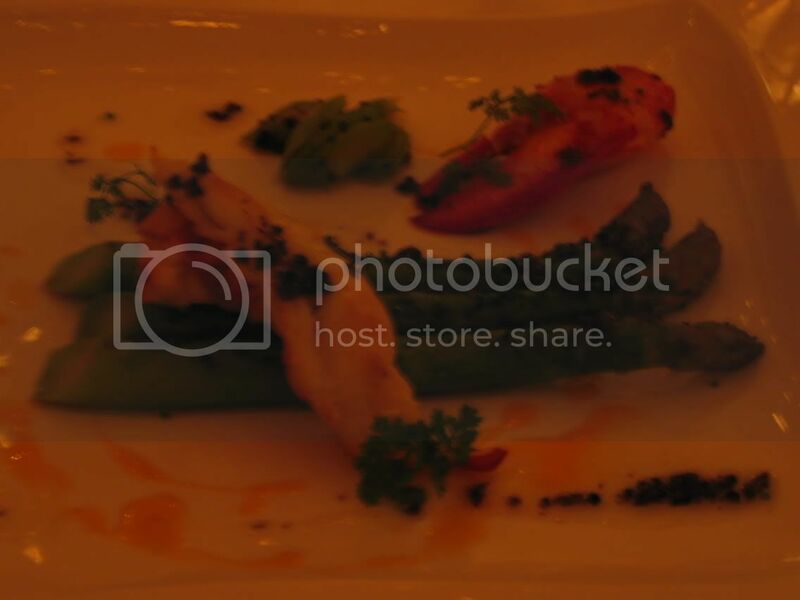 My starter was a warm lobster and asparagus salad ($43) that, in addition to the heart-stopping price tag, was very enjoyable. The amount of lobster given was generous, cooked to that elegant state of firmness yet not rubbery, and the fat asparagus spears were crunchy to the bite and delicious. 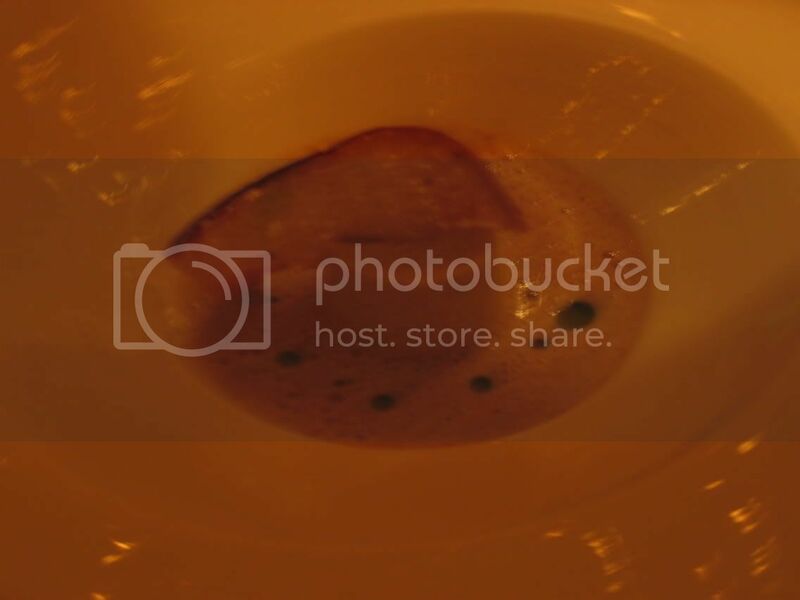 An intermezzo followed, a lovely moulded foie gras in a mushroom emulsion. The foie gras was smooth and velvety, well complemented by the robust emulsion, with a thoughtful slice of biscotti for you to enjoy your liver with. Coming to a restaurant like this, I can never help but order the lamb cutlets ($69), which generally can always be found on the menu. Lamb cutlets are so emblematic of fine dining that they're a fairly reliable yardstick of a chef's haute cuisine capabilities. Thankfully, I wasn't disappointed - the cutlets were meaty and tender, done exactly medium with a bashful rosey blush suffusing the young meat. 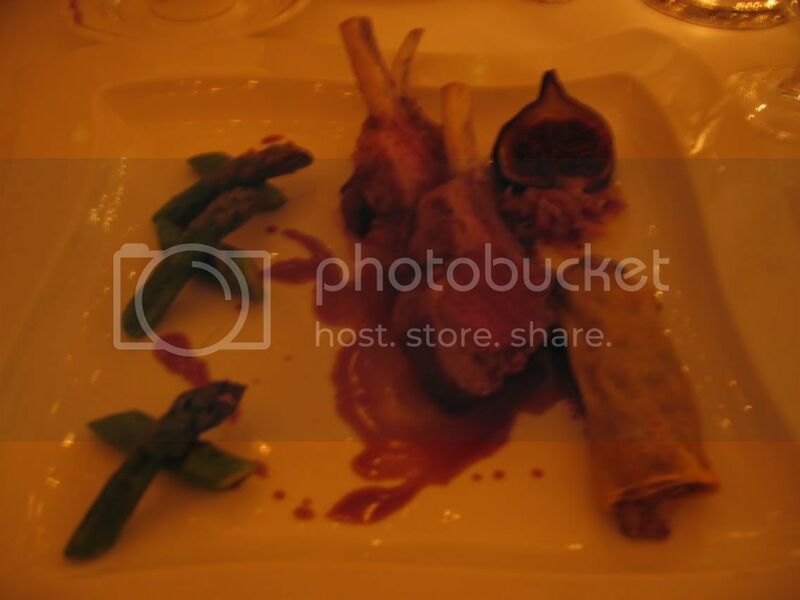 Served with figs and stuffed pastry, as well as some asparagus tips, this dish was very satisfying indeed. 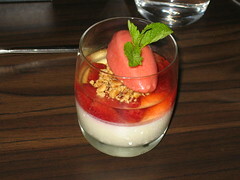 The pre-dessert was a layered affair, of custard, a fruity (strawberry) chocolate ganache and yoghurt espuma. Light and tantalising, my only caville is that the jar it was served in was too small for the spoon to fit comfortably. 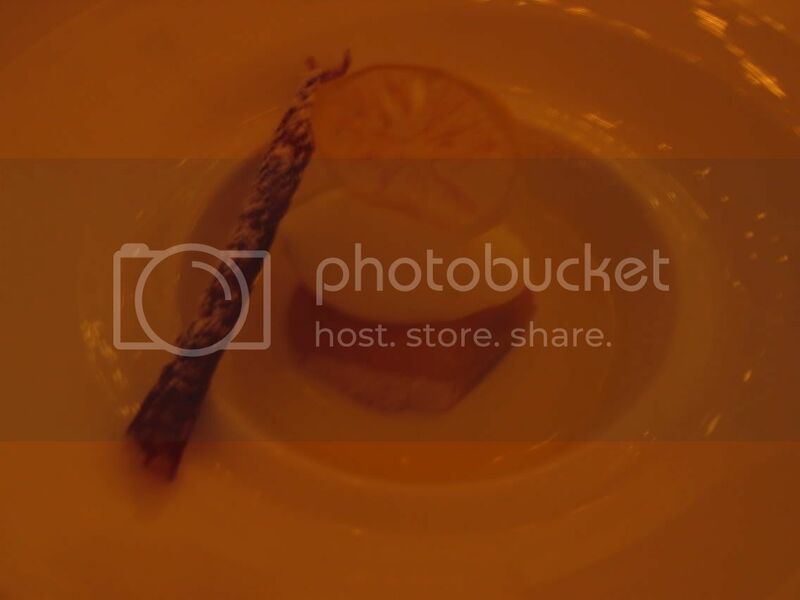 Enticed by the pre-dessert, I was looking forward to the actual desserts, but this was where the restaurant faltered. My peach confit ($22) was a rather forlorn looking peach half in a pool of white chocolate sauce, which seemed rather bereft of the imagination present in the other dishes, and not at all worth the cost. I was utterly astonished when my god-sister's souffle emerged, because instead of the towering triumph of French dessert cuisine I was expecting, the result was ruptured and dismal-looking, hardly recognisable as a souffle. Service is naturally impeccable, with the maitre-d personally serving and looking into your every need. You can't get a better ambience than this, though the air-conditioning is rather chilly, and most people may baulk at having to dress up just for dinner. 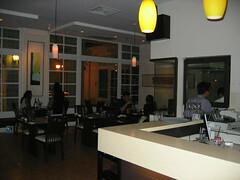 Overall: A good place for that special night out. Be prepared to spend, though, but skip dessert. 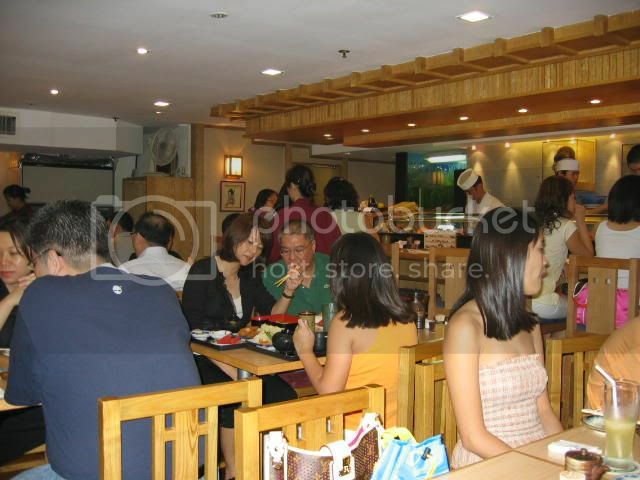 "A convenient stop for a slow weekend buffet for families before they embark on an afternoon of shopping at Marina Square." What am I talking about? Find out more here. That was certainly a nice bit of alliteration. Earlier this week I had the fortune of attending a patisserie course at Canele, taught by Chef Pang Kok Keong, the enfant terrible of Singapore's pastry world. 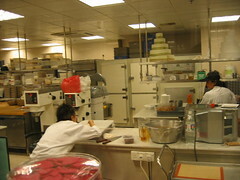 The course was conducted at Canele in Robertson Walk, a veritable chocolate factory with patissiers all hard at work behind the glass wall like stylish Oompa Loompas. 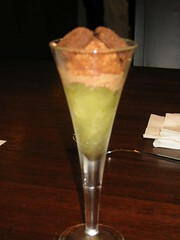 First on the list was a cocktail of limoncello granite, chocolate espuma and chocolate crumble. If that sounds intimidating, that's because it is. While not technically difficult, the patience required of systematically creating each component and assembling them may be slightly beyond my ability. 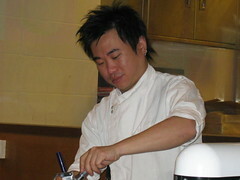 Here you see Chef Pang charging his siphon in order to create a cloud of chocolate espuma for our benefit. Makes you want to just get your hands on one. 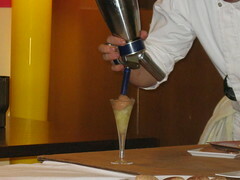 The siphon was used to pump nitrogen-pressured chocolate foam on top of the granité, before topping with chocolate crumble cubes and cocoa powder. I was fortunate enough to taste the final concoction, which I quite enjoyed. The punch from the limoncello was considerable, even though it'd been cooked slightly, and unfortunately the granité melted too quickly, so I didn't get a good contrast of textures. Next on the syllabus was something I was really looking forward to. 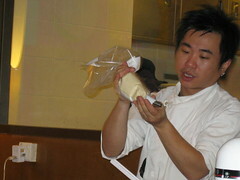 It's not, as you might think, Chef Pang teaching us how to fill a piping bag with whipped cream. Here he's piping beautiful shapes onto a baking tray. Guessed it yet? Not choux pastry, though it's a good guess. Any idea yet? It should be pretty obvious by now, but let me help you along a little more. 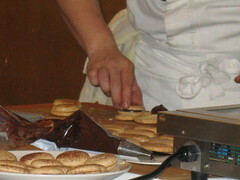 Yep, those are chocolate macarons Chef Pang is so carefully sandwiching. The very same macarons I became fascinated with after J of Kuidaore's exceedingly enlightening post about them. While Chef Pang made making macarons look like an everyday affair (and I'm sure for him it is), it may take me a while to work up the courage to attempt them myself. 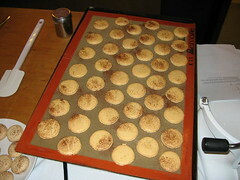 Nonetheless, I'm very glad to have had a first-hand view of the pitfalls and pointers in making macarons, should I ever try my hand at them. 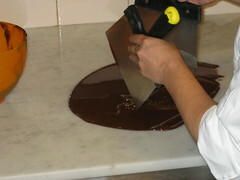 Our final lesson involved a short tutorial on tempering chocolate, which strikes me as something the home cook would be unwise to attempt, unless you happen to have a customised marble top lying around and ample air-conditioning. 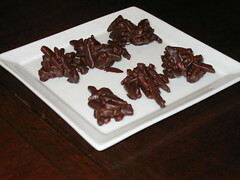 The tempered chocolates were to coat the roasted almonds that had been heated with caramelised sugar to sweeten them, as well as some butter to improve their aroma. The end result: Swiss Rocks. Coated with glossy chocolate, they were crunchy and intensely aromatic, having benefitted from a substantial roasting period. The course was certainly interesting and educational, and even came with lunch prepared the chef (although I think his desserts are better). I've been itching too badly to write about the recent dinner to put it off any longer, so I decided to put everything else on the back burner and get this out of the way first. Be prepared for a long post. Organisation is not my forte, and the idea of organising an affordable, good-quality and memorable dinner for all the food bloggers in Singapore seemed daunting at first. Looking for sponsors and media publicity were the most frustrating parts of the planning, taking up much of my time, to the extent of my neglecting the more important details, like wine and dining preferences. Still, my unhappiness at missing the lunch last year and the thought of being overseas and unable to attend the next three years' worth of meals kept me going, as did Chubby Hubby's generous contributions in helping me look for (and acquiring) sponsors for the dinner. I swear, that man is an F & B god. Sage is not a very large restaurant, and by the time I got there most of the food bloggers were present, chatting animatedly. I had just enough time to snap a picture, have some final words with the wonderful restaurant manager Kimberly before being swept up in conversation with all the food bloggers. Even though they were strangers, conversation flowed easily and we were soon chatting and laughing like lifelong friends. Each place setting was laid with the menu you saw above, and a box of Artisanal Chai tea obtained for us by the amazing Aun of Chubby Hubby. These weren't even on the market yet, and were in fact designated for delegates' use during the upcoming IMF-World Bank Conference in September. Dinner started before very long, with the fricassée of Burgundy escargot with lentil du puy and field mushrooms, poached egg and Italian parsley foam. 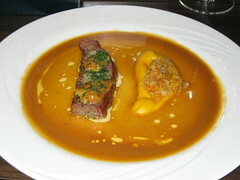 I must admit I had reservations about this dish, as it was such a radical departure from the traditional preparation. Plus there was the viridian green foam to get past. Both Kimberly and Aun convinced me it was a winner though, and from my first bite, I couldn't agree more. 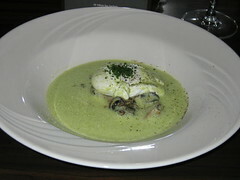 The egg was poached perfectly, and the richness of the runny yolks flavoured the escargot and mushrooms. The parsley foam was out of this world - frothy and light, yet with its own body of sweetness that envelopped the whole dish. 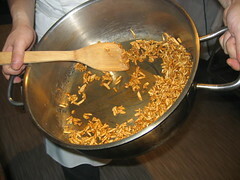 The lentils were a creative touch, contributing a different texture to the soft molluscs. 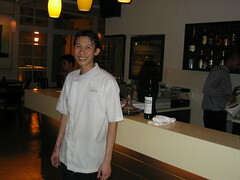 I was really impressed by Chef Jusman and his team. His kitchen is not very large, but he had no problems delivering on the goods. None of the dishes were cold and all were excellently planned and plated - but the crowning glory had to be the oxtail consommé with chestnut mousseline and truffle-infused foam. While I was intrigued by the unorthodox presentation, I didn't think more of it till my spoon plunged through the stratifications of foam, broth, mousseline and oxtail. 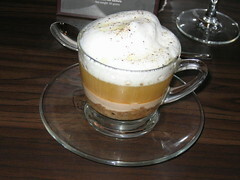 I inhaled the foam, and the aroma of the truffle oil hit me and flooded my brain with happy endorphins. This was followed immediately by the full-bodied broth, relentlessly pursued by the sweet, luxurious chestnut mousseline and finished off by the meaty oxtail. It was so good that I spent several minutes in silent contemplation of how best to make it last longer. But alas, my appetite overcame my better sense. 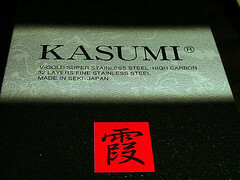 Courtesy of the magnanimous Razorsharp in a deal arranged by Chubby Hubby, we were each given a 12cm Kasumi paring knife. This knife certainly looks lethally sharp, so I can't wait to get my hands on some unsuspecting vegetables. Our next course was a baked fillet of sea bass, topped with tiger prawn mousse, braised fennel and a lemon-basil emulsion. I must admit that I didn't enjoy this course as much as the first two, but then again, I'm not much of a fish person to begin with. The next course, though, put me back on epicurean cloud number nine. The US corn-fed beef shortribs braised in red wine, topped with slices of foie gras and bone marrow, glazed root vegetables and a moussline of butternut pumpkin, was rather like paradise on a plate. Being no stranger to braising myself, I was still in awe of the meltingly tender shortribs, enriched with foie gras and marrow. 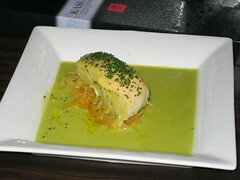 The pumpkin and vegetables only served to sweeten the dish, making an already pleasurable experience truly delectable. 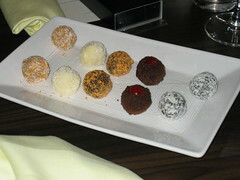 Before our dessert, we commenced a lucky draw that looks set to become part of food blogging tradition. The prizes were a 27cm Masahiro Slicer, again supplied by Razorsharp, a Staub fondue set and TWO Staub cocottes, generously donated by BATS Singapore, both amazing companies whose largesse is definitely appreciated by the food bloggers. The slicer was won by Sook Yoon of Sook's Food Notes, whom I'm positive will be putting that to excellent use in her kitchen. 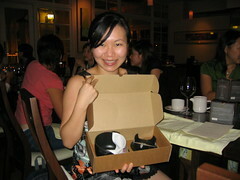 The adorable petite fondue set went to Charmaine, and I'm sure she agrees that everyone can do with a fondue set. 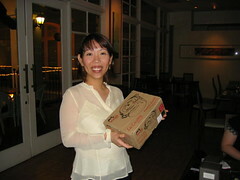 ST of Cheat Eat won the first cocotte, as you can see her hefting her prize here. 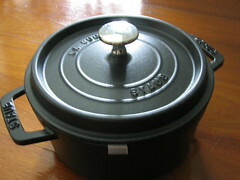 As for the last cocotte, that was won by yours truly, in a lucky draw that I swear was not rigged. I've always wanted a cocotte and I couldn't be happier with this one, but I'll wax lyrical about it another day before this post runs on too long. Back to the dinner. Dessert was a Fromage Blac panna cotta topped with candied strawberries, Champagne jelly and a strawberry sorbet. 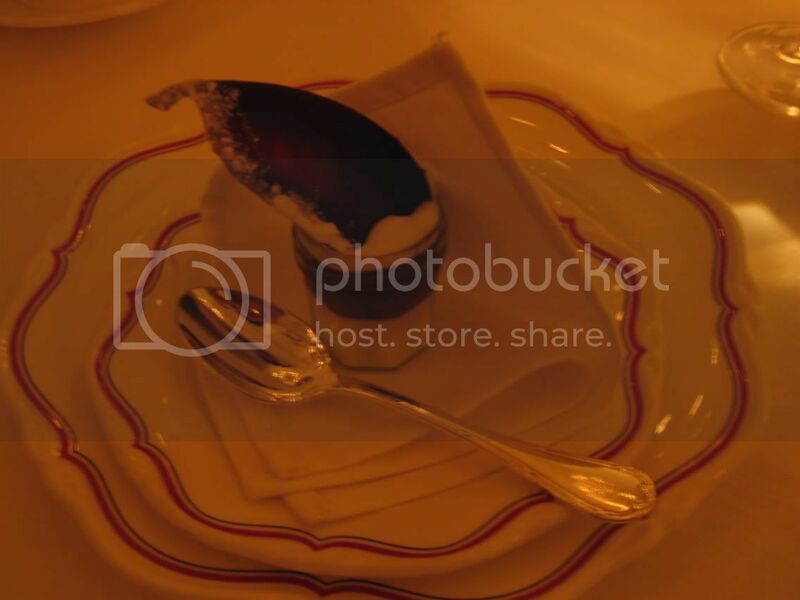 The panna cotta was a little thicker than usual, but less sweet thanks to the cheese. The strawberries cut through the sweetness of the jelly and cream, and the sorbet was quite magnificent - a smooth, just tart quenelle that held its shape incredibly well. While Chef Jusman was breathing a sigh of relief that dinner was over, the eating didn't end there. 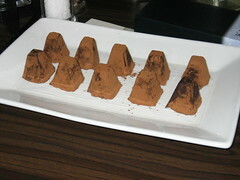 A surprise birthday cake arranged by my unbelievably thoughtful and lovely sister was shared around, as were an assortment of excellent chocolate truffles supplied by Julius Truffles, an old schoolmate turned entrepreneur-chocolatier I serendipitously discovered while organising the dinner. As an exhausted Chef Jusman emerged to tumultous applause fom the well-fed bloggers, we were basking in the comfortable atmosphere of a truly exceptional meal, chatting about food and exchanging vignettes of life in general. Much has been said how we were relieved to be in the company of others whose ideas of appreciating food involve taking beautiful photos of them as much as eating them, and the air of familiarity and understanding between all of us was as palpable as the ovation we gave the chef and his wife Kimberly. I can safely say without exaggeration that this is probably the best dinner I've had all year, in terms of food and company, and for that I have a number of people to thank. Firstly, to Chef Jusman and Kimberly, the foremost husband and wife restaurant team, for helming Sage and being such fantastic hosts to a rowdy group of demanding food-lovers. Next, to our sponsors BATS Singapore and Razorsharp, for their truly spectacular donation gifts and recognition of the food blogging community. I hope we may work together again in future collaborations. 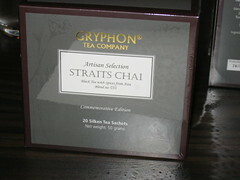 Thanks go out also to Julius from Julius Truffles for his creative chocolates, and to the Gryphon Tea Company for their premier Straits Chai blend tea. To Chubby Hubby, for his extensive contacts and resources in the F & B industry, without which we could not possibly have settled on Sage as the venue, nor could we have enjoyed the magnificent sponsored gifts. 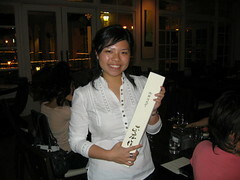 To Ivan and Umami, who provided some fabulous wines and liquors, which certainly helped lubricate the already-scintillating conversations. And finally, to all the food bloggers who attended the dinner and made it such a smashing success that was enjoyed by all. Really dashing through posts here, in order to get to the food bloggers' dinner as quickly as possible. 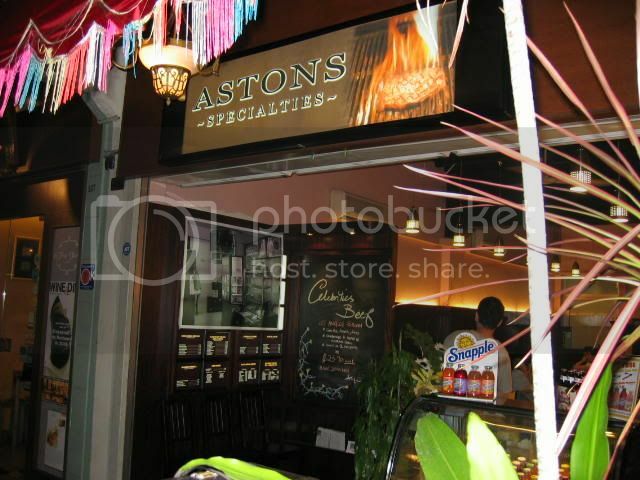 In my previous post on Phin's Steakhouse and budget steaks in Singapore, I was recommended Aston's at Joo Chiat by Ivan of Recent Runes. We visited Aston's for dinner one night, and although I had heard good things about their Burgundy roast beef, I decided not to place an advance order ($59/kg) and just relied on their normal meats. 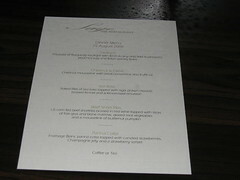 Just as well, as the special for the night was a US corn-fed sirloin for only $24. Aston's really does serve cheap meats - a rib-eye steak goes for about $12, or $15 if you choose a larger steak. All steaks come with side-dishes, and pastas come with the soup of the day. Excellent value for money, it must be said. 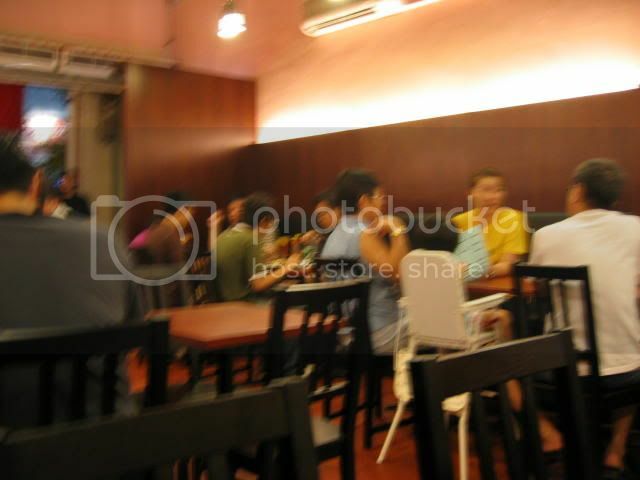 The inside of Aston's is really small - accomodating about 20+ people, tops. It opens onto the road, so even though there are air-conditioning units, it's still quite warm, so be prepared to dress down. What I was really surprised by though, was the service, or lack thereof. Some of the waiters and waitresses could hardly be bothered to notice if customers needed attention, and one of them was so poorly informed as to what was on the menu that being served by him was a truly frustrating experience. Another problem was logistical - Aston's ran out of food really quickly. They were out of garlic bread, out of house salad, out of broccoli and out of onion rings. While I'm sure this is indicative of Aston's popularity, it was nonetheless rankling to have to keep changing orders. Aston's is definitely popular though, so you should make a reservation if you're thinking of going down. 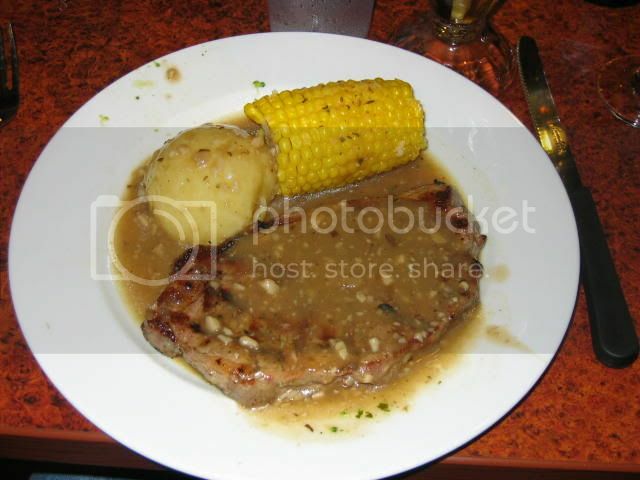 The sirloin steak was definitely cooked competently - medium, tender and tasty. The corn and potato too, get no complaints from me. What I didn't like though, was the sauce. The steak was fairly drowning in sauce, which also had an excess of cornstarch, resulting in a "skin" forming across it very quickly. Overall, it was felt that Aston's is really affordable, a great place for students and casual diners looking for a meat fix, but its location, ambience and service will not endear it to those looking for something more refined. 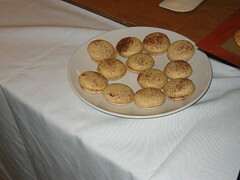 There is also no dessert, which I feel is something that should be looked into, as everyone needs dessert after beef! It occurred to me last night that I have a rather alarming backlog of posts to clear before the food bloggers' dinner tomorrow, so I decided to get cracking. Since lovely Chermain was off to China for some mountain-climbing, and since there's going to be a chronic absence of good Japanese food in the UK, we decided to go to Akashi for lunch. Akashi is located in Tanglin Shopping Mall ("Oh, the carpet place," said Chermain) and seems to have a reputation for serving pretty decent Japanese food. While I'm not a connoisseur, I've heard fairly reliable accounts. The most telling sign though, was the crowd. The restaurant was completely packed and it was only by extraordinary good fortune that they managed to have a table for two available for lunch. One of the best things about eating at Japanese restaurants are the steamed edamame beans ($4) they serve before the start of every meal. 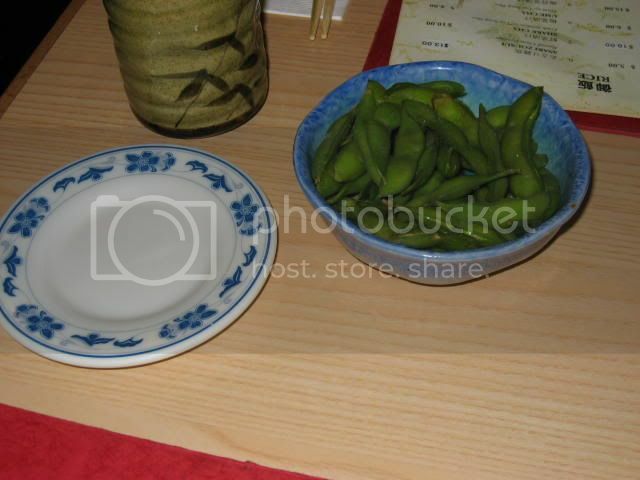 Asian restaurants always serve the best appetisers; whether it's Japanese steamed edamame or Chinese braised groundnuts. There's something about beans and nuts; maybe being Asian makes them terribly addictive. I wonder though, do they still charge you if you don't eat them? I ordered a California Temaki ($6) because I'm a wimp about eating raw fish. 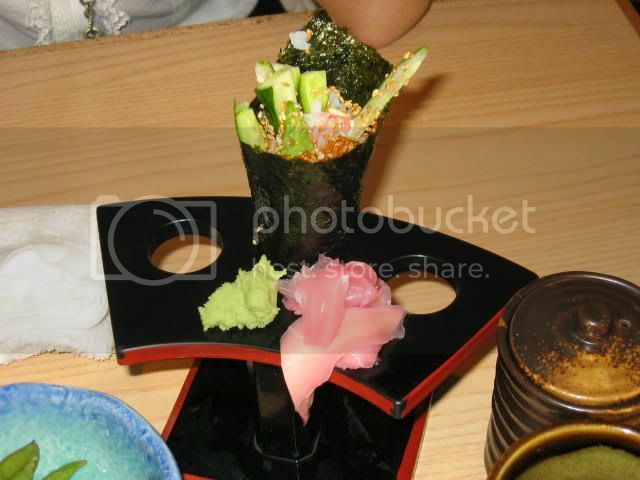 The seaweed was rather chewy and tough - probably a better idea to stick to the cut hand rolls. 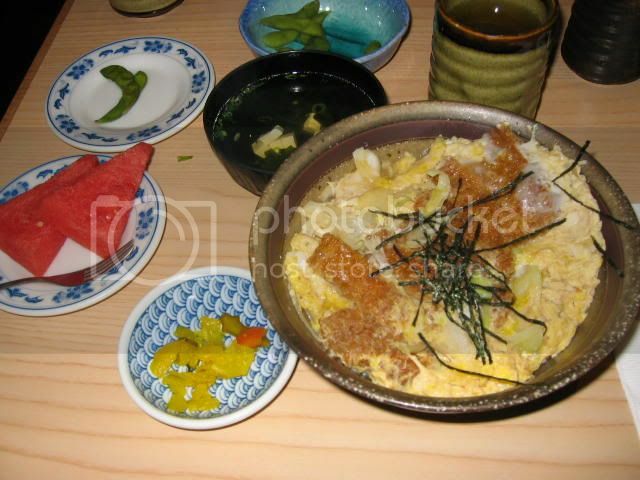 The pork katsudon ($14) that I ordered was pretty eggy, and the rice wasn't as fluffy as I would have liked. In fact the whole thing felt a little sodden to me, though that may have been because I waited for a while before eating. Good watermelon, though. Chermain had a Chirashi Ju, or what I prefer to think of as the colourful set. It had red prawns, green cucumbers, yellow egg, pink sugar and who knows what else. 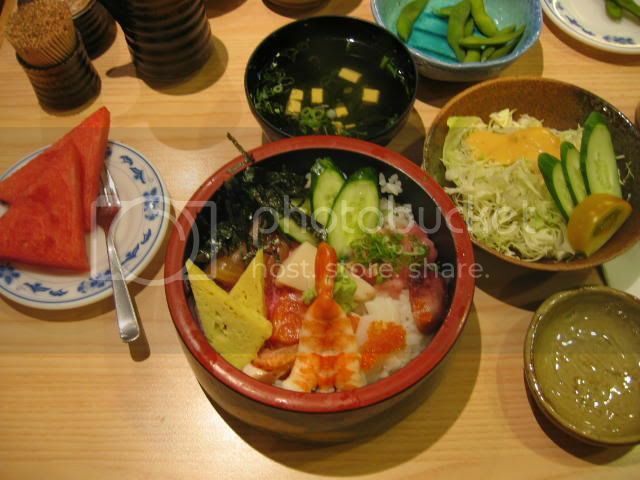 Akashi is located on the outskirts of Orchard, though there are two more outlets in City Link Mall and Paragon. The atmosphere you get here is generally pretty boisterous, as it's always crowded, and the chefs tend to have really convivial conversations with their regular customers. Add that to the traditional greetings all the service staff shout as someone enters the restaurant, and you get a pretty jumping scene. Service, though, is a little lacking, as some of the waitresses sweep past without much attention to you.